As many as 16 tornadoes hit North Texas on Wednesday. An outbreak of as many as 16 tornadoes slammed through several small communities in three North Texas counties after sundown Wednesday, killing two women and four men while injuring more than 100 others. According to officials, 14 people from Granbury were believed to be missing overnight Wednesday, though that number was reduced to seven Thursday morning. Hood County Sheriff Roger Deeds said he is confident the missing people simply haven't checked in with authorities, but that officials won't know for sure until every piece of debris is turned over. The violent spring storm scattered bodies and threw trailers onto cars while leaving many, possibly hundreds, homeless in Granbury and Cleburne when an untold number of houses were reduced to nothing more than a concrete slab and a pile of rubble. The National Weather Service said Thursday that preliminary damage estimates indicated an EF-4 tornado, with wind speeds between 166-200 mph, touched down in Granbury; and an EF-3 tornado, with wind speeds between 136-165 mph, later touched down in Cleburne. The highest rating on the EF scale is an EF-5, with wind speeds in excess of 200 mph. Deeds revealed the identities of the storm's victims as Glenda White, Bob Whitehead, Tommy Martin, Jose Tovar Alvarez, Marjari Davis and Leo Stefanski. Both the DeCordova Ranch and Rancho Brazos neighborhoods, where Deeds said 97 of the 110 homes in the neighborhood were damaged or destroyed, remain sealed off to the public. Deeds said residents attempting to salvage personal belongings will only be allowed back in the neighborhoods once hazards, such as downed power lines and compromised gas lines, are repaired or removed. In Cleburne, east of Granbury, storm spotters told the NWS a tornado that was estimated to be a mile wide tore through the town Wednesday night. 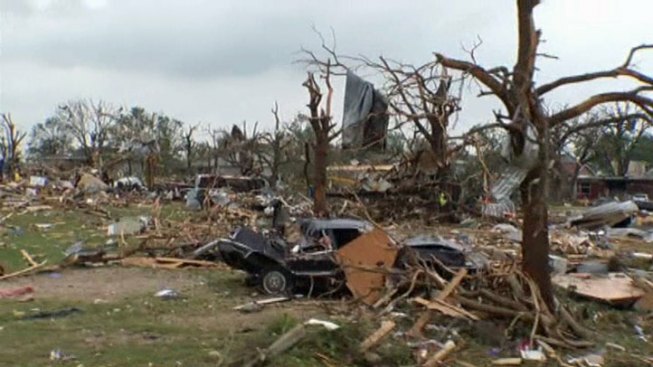 NWS officials later determined the Cleburne tornado to be an EF-3 with winds up to 165 mph. Mayor Scott Cain said early Thursday that no one was killed or seriously hurt in Cleburne, although seven people suffered minor injuries. He estimated that dozens of homes were damaged and declared the area a local disaster.